How is the walk from Pleasant Canyon to Panamint City, is there a preferred route? Sure, drive up Surprise Canyon! It appears that it is a walk of about 5 miles into Panamint City from Chris Wicht with an elevation gain of about 3,000 feet. Sound Right? And another 5 miles and a thousand more feet of elevation gain to Hungry Bills. Then 11 more miles from Hungry Bills to the west side road. Sound right? Sounds like a pleasant three day trip. Anyone else been over Panamint Pass? Those distances sound about right. It has been about 20yr since a good friend and I hiked across. It makes a nice easy overnighter. Need to shuttle a vehicle. Can't speak for the distance from hungry bill's to west side road, we parked our shuttle rig at the base of the canyon out of the wash.
Getting back to the original question, I've done it. Drive up Pleasant to the road that goes to the saddle above Happy Canyon. Park there. Walk down to the Westin Cabin and then up the west fork of Happy. (There are three forks here: the one you just hiked down, a middle one, and the west fork). The top of the west fork gets very steep, but there is a mine site near the top. From the mine site there is a trail to PC. The full hike is probably about six or seven miles each way with some very steep parts. If you come over from Happy to Panamint City, beware of a sudden chasm between Hemlock and Wyoming mines (much closer to Wyoming). If you go that way, you can bypass it by going well above it or below it on the hillside. It is roughly here and is right in the middle of the connector trail. The route I describe stays pretty far away from the Hemlock mine, crossing Marvel Canyon at about 8000 feet (if I'm counting topo lines reasonably accurately). The mine site I refer to is not shown on the topo, btw. I've also explored the area several times from the Surprise Canyon side and up the unnamed side canyon from Happy Canyon opposite Cannon Canyon. Most of this was back in the 1990s. So, if I understand it correctly, you are suggesting going up the side canyon in Happy across from Cannon (or do you mean the next side canyon east of that one? ), and then following the divide eastward, passing Marvel. That is where I am confused as to what the route is down to Panamint City. Digonnet describes a route via Hemlock and Wyoming mines (though going the other way). It is this connector trail that runs into the chasm. What are the approximate coordinates of the unmarked mine you are talking about? Is it the Hudson River Mine ( http://www.panamintcity.com/panamint/hudsonriver.html )? This image more or less corresponds to the route I recall from the 1990s. The yellow line shows the steep ascent out of the fork of Happy (it's the north/west most - furthest to the left as you look up canyon - of the three forks which diverge near the Westin Cabin). 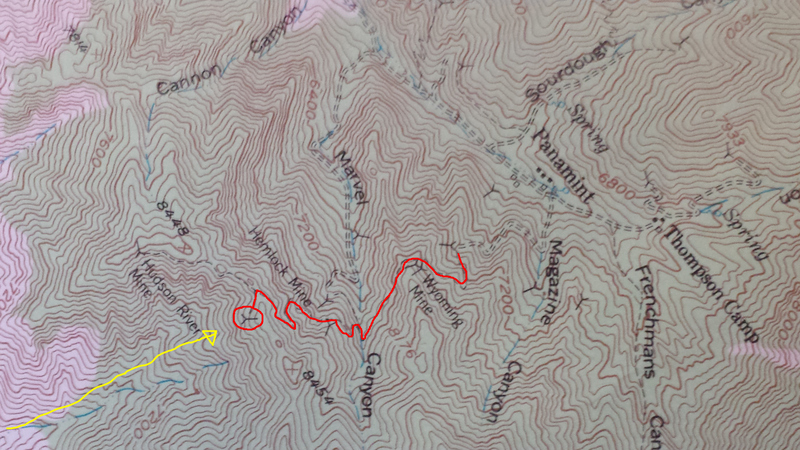 The red circle is the unnamed mine site and the red line more or less corresponds to what I recall from the hike. I don't recall a "chasm" and also I don't recall the trail being 100% continuous from the unnamed mine although most of it was there. I returned to the unnamed mine site via the same route (parked at the saddle between Pleasant and Happy) a few years ago (probably 2012), but hooked more toward Sentinel instead of going to PC. I got it now. Thanks! The red line does indeed go near that chasm, just before it makes the right turn around the Wyoming mine label. Perhaps there was some sort of collapse since you were there? Anyone going near it should know it's there, since it is a fairly level stretch of trail and some might choose to run or otherwise move very quickly and not notice it in time.